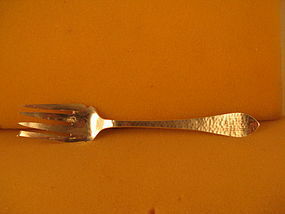 Four tines, the left one shaped. Upturned handle, pointed end, hammered finish. Length 8-1/2", weight 2.2 troy ounces. The monogram is an intertwined GH. Overall and mark condition are excellent.